1st October 2018 marks the opening of Mickey’s PhilharMagic (or Mickey’s PhilharMagique in French), which has been brought to Disneyland Park specially for the Mickey 90 Mouse Party. 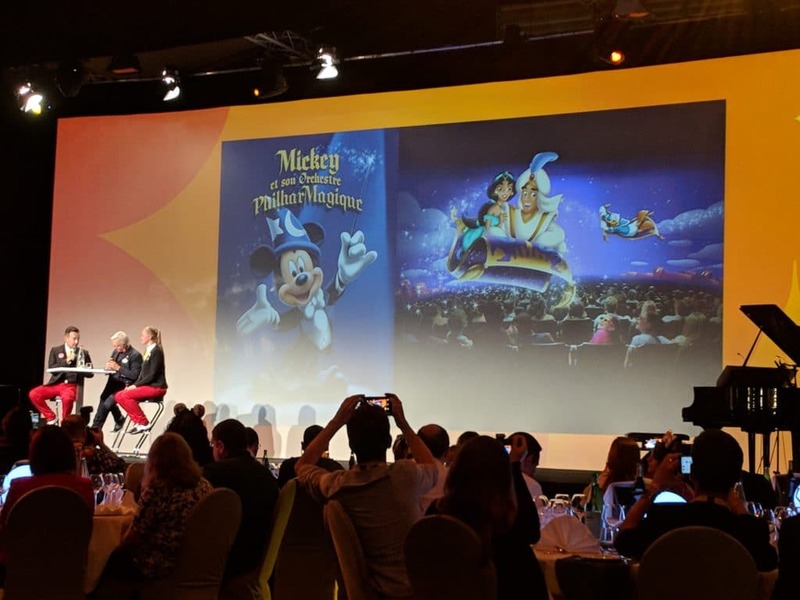 The addition of Mickey’s PhilHarMagic was announced earlier this year during the InsidEars event. 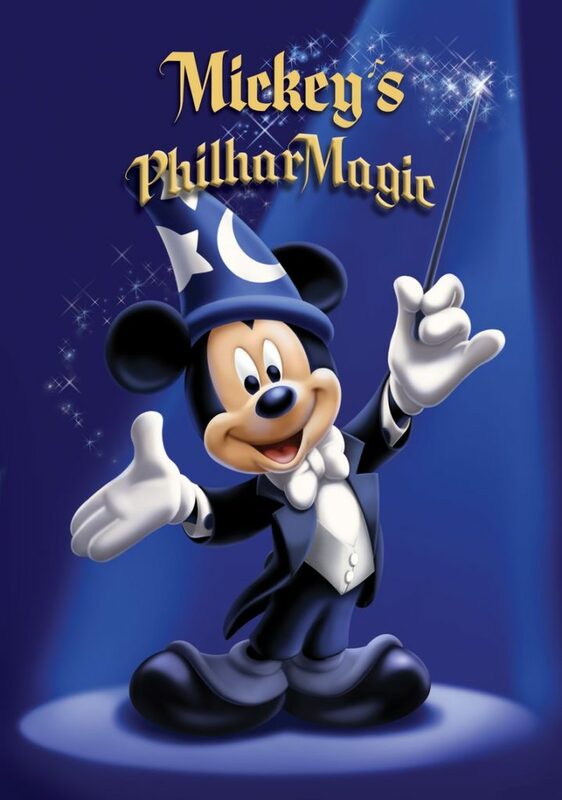 Mickey’s PhilharMagic is an adapted version of an attraction which is already present at other Disney Parks around the world, and which combines a 3D film, dialogues in French and English, and special effects devised to take guests to the very heart of the adventure. Once in their seats, guests will see Mickey and Donald come to life on the big screen of Discoveryland Theatre, and will embark on an unforgettable journey. All of a sudden, Donald bursts onto an empty stage and takes advantage of Mickey not being there to take his conductor’s baton and put on his magician’s hat. This marks the start of his adventures as Donald is whisked away by a whirl of magic and music. Transported to some of the greatest Disney classics, such as Aladdin, The Little Mermaid and The Lion King, our guests are taken on a whirlwind tour of the most memorable songs in Disney animation history while at the same time experiencing a number of unexpected twists caused by the uncontrollable Donald. Let’s take a closer look at this adventure which has never been seen before in Europe, with Show Producer George Scribner, an Imagineer who is also a figure in the world of animation, having directed animated classics such as Oliver & Company and Mickey’s short The Prince and the Pauper. We needed a 3D project that the whole family could enjoy. So, we played around with a lot of ideas like Mickey leading an orchestra and going into some of our most beloved movies. Walt Disney Imagineering’s Creative Executive Tom Fitzgerald set up a creative team with me as the director. Then we began to brainstorm different concepts very early on, using Tinker Bell and Mickey. At that time, there was no Donald Duck. How did you build up that first version? We found the idea that perhaps Tinker Bell could travel through each of the different movies using her wand and magic, and transport the audience through these films. She would move through them and interact with Lumière, Ariel or Jasmine. One of the first things that we did was also build a music track so that we had a flow with beginning, middle and end, emotionally. We tried different songs to have a full range of emotions and sensations. How did Donald finally come into that story? We spent about a year storyboarding it and shaping it. We all loved it, but then we realized it could be more entertaining with a character like Donald. So, we re-imagined the whole film with Donald instead of Tinker Bell. I did a very quick series of drawings with him moving through each sequence asking myself what his emotional reactions would be. So, when he met Ariel, he would fall in love, when he met Aladdin and Jasmine, he would feel the wonder of flying, etc. It turned out to be a much better decision, much more entertaining. Somehow much more cartoonish as well. Absolutely. You can do so much more with Donald. Everything he does is an extreme. When he gets angry, he gets REALLY angry; when he’s teasing that little broom before the big Mama Broom comes out, he just goes for it; when he falls in love with Ariel, he’s completely overwhelmed by his feelings; when he flies with Aladdin and Jasmine, he’s just completely blown away by the sensation of flying. This is a character our guests really love. There’s some Donald in each of us, and Mickey’s PhilharMagic was an opportunity to show a whole range of emotions for this character who is one of my favorites. I’ve directed him several times and he’s just a lot of fun to work with because he’s just so out there. With him, the gags are bigger, broader, and generate bigger laughs! The animation of Mickey’s PhilharMagic was created by artists of the Walt Disney Animation Studios. How did you work with them? They were involved right from the start, as soon as the first brainstorming sessions, when we were searching for the storyline and various concepts. We had a couple of animation storyboard artists who helped us with it and then, when we went into production, Hendel Butoy (who directed The Rescuers Down Under and two sequences in Fantasia 2000) became the animation director. They did all the modeling and the animation. They made a huge difference. And not only that, we were also able to use some of the original animators who worked on the films, like Nik Ranieri for Lumière, Glen Keane for Ariel and Mark Henn for Jasmine. It really added quite a pedigree to the film. Modeling those 2D characters into 3D characters must have been quite a challenge. Absolutely. It was the first time those traditional characters got fully modeled digitally. We sort of broke a barrier here. It was not easy and demanded lots and lots of work, but in the end we were, I think, pretty successful. We were very lucky to have modelers from the Walt Disney Animation Studios because they had such great resources to find solutions to this problem. We went through a lot of iterations to get our characters right. The hardest one was Ariel because she gets so close to the camera in her scene. Female characters generally tend to be harder than men because their skin and features are so delicate. The slightest, smallest change of the design changes the look of the character. That’s why Glen Keane also helped us with her model. Ariel’s hair was one of the hardest things to do because it’s such a part of her personality. We didn’t have the software we have now that allow the rendering of almost every hair, like in Tangled. So, we simplified the shape into a mass so that it looks as close as possible to the original film. What about Mickey, the true conductor of this magical orchestra? Since it was the first time he had been translated from 2D to 3D, the Walt Disney Animation Studios put a great deal of effort into getting the model and the rig just right. They did an amazing job. The direction we chose was the Freddy Moore version from the late 30s (The Brave Little Tailor) probably the most appealing design of this character, which I also adopted for The Prince and the Pauper. From then on, what was the role of the original animators? They became the leads for those scenes. Nik Ranieri even animated some shots with Lumière when Donald falls into the world of Beauty and the Beast. They were happy to do it, and we were happy to have them. And because they were on board, they just turned in performances that were exceptional. As a director, when you hand a scene off to an animator and you get back more than you expected, that’s truly the mark of a great artist. They really made the film what it is because having those original men and women touch the film gave it a link to the earlier films, and a believability that was fantastic. Having the animators who designed and created the characters brought such an honesty and a level of performance that were just hard to beat. Speaking about translating of 2D into 3D, how did you approach the « I Just Can’t Wait to be King » sequence, taking into account the unique design of that number in the original film? When thinking about the overall structure of our film, we were searching for a series of sequences that had a flow and a journey to them, and a variety to them. As you can see, each one is very distinct from the others. For that sequence, Hendel suggested that we go in for a more graphic, spatially flat design. We just wanted to have fun with something different from what we had done in the other sequences, which were more grounded, more believable, more traditional. We loved it because it gave Mickey’s PhilharMagic a completely different look. Mickey’s PhilharMagic has very few dialogues, and relies mostly on the visuals and the music. The more a film works visually, the stronger it is. It was very deliberate. And regarding the soundtrack, we made a rough assembly of different songs. We spent quite a bit of time working on « Ok, what follows what? What’s the right emotional, musical feel to this? ». And then, we had a composer named William Ross, who is also an arranger, come in and we did a series of orchestral sessions to tie together either existing cues or cues that were re-arranged slightly to work for our film. We tried as much as possible to use the original tracks from the films and only add arrangements to tie sequences together. The music was probably the most important thread in the show because it is so well known, conveys so much emotion, and our guests already know it. It is that sense of familiarity that gives the film its pleasure and comfort. How did you approach the in-theater effects? They were choreographed very early on under the storyboard. As we were mapping out the storyline and the emotional journey on a parallel track, we were also mapping out and conceiving where the 3D effects would go, and what would be the in-theater effects like smoke or wind. It was a difficult thing to do because you can’t put too many effects in a row. It was a tricky thing to pull off but in the end we were all happy with it. Mickey’s PhilharMagic has already amazed so many guests over the world and is now opening in France. How do you explain such a success? There’s something universal about it. These characters are so much loved around the world and Donald Duck is a favorite everywhere. It was a clever and unique juxtaposition of him with our feature characters, which brings such a fresh approach. And there’s a true sincerity in our film. We never talk down to our audiences. If you really love what you do, that comes through. I’ve heard it about painting, I’ve heard it about music: it’s an intention that sits behind every work of art. I’m so happy it’s coming to Disneyland Paris. This is probably the project I’m the proudest of at Imagineering. I sure hope it does well in France.